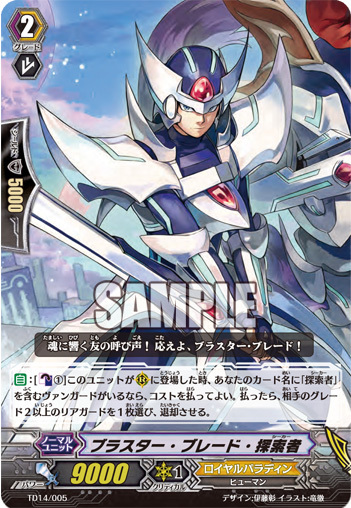 [AUTO]:[Counter Blast (1)] When this unit is placed on (RC), if you have a vanguard with "Seeker" in its card name, you may pay the cost. If you do, choose one of your opponent's grade 2 or greater rear-guards, and retire it. [AUTO](VC):When this unit performs legion, search your deck for up to one grade 2 or greater card with "Seeker", call it to (RC), and shuffle your deck. Blaster Blade: "The call of friends resounds through the soul! Strike home, Blaster Blade!" Wingal: "No matter the distance, I will always be by your side." The ability, Legion, allows Mates to be called to the Vanguard Circle, letting them fight together! If two specific Units with the "Legion Mark" at the bottom of the card are assembled in the Vanguard Circle, you can form a "Legion"! During any battle, their power will be 20,000 for a Legion Attack! And you'll be able to use stronger Legion Skills. 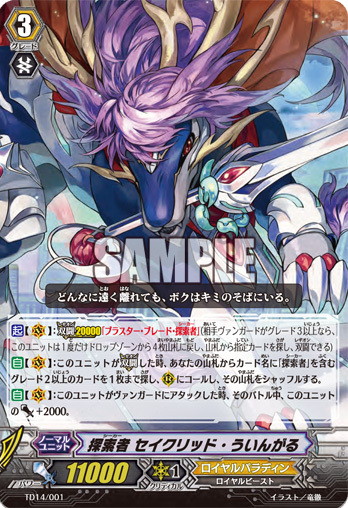 When "Blaster Blade Seeker" and "Seeker, Sacred Wingal" form a Legion, you can call a Grade 2 "Seeker" from your Deck to a Rearguard Circle! Check out the "New Ability: Legion...!?" Page for more details!!! !